On today’s episode, I’m talking with Sally Haughey from Fairy Dust Teaching. If you’re not familiar with her work, you really need to check out her blog, Fairy Dust Teaching. Sally and I chat about the best way to engage young children in the art making space. You’ll learn why the method Sally uses is just so important and effective with not only young children, but ones of all ages. 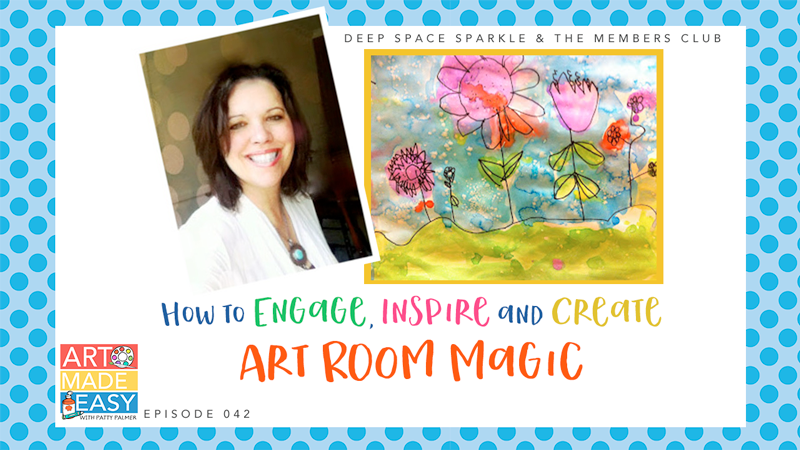 This episode is for anyone who struggles with finding the right balance between a creative art-making space and behavioral expectations. For all the budding singers out there, DOWNLOAD SALLY’S ART SONGS PDF to get you started…. Just click the blue box, enter your name and email and I will email you the PDF. Make sure to check your junk mail (or promotions folder in gmail). Patty, this was a wonderful podcast episode. I was tearing up at the end! What an authentic and inspiring interview! Thank you Amy. I agree…Sally moves me too. This was such a great one, and it was perfectly timed for me after having a very rough day with some of my first graders. Thank you so much for presenting Sally’s perspective. I really appreciate all the helpful reminders. Thank you Sally and Patty. What a wonderful pod cast! Thank you for some of the great reminders.